Cambridge Azur 851N vs Pioneer N-70AE - which is the better music streamer? | What Hi-Fi? Cambridge Azur 851N vs Pioneer N-70AE - which is the better music streamer? If today’s music streamer was an animal it could well be the tardigrade, “the world’s most indestructible creature”. Able to survive being boiled, frozen and crushed, it’s highly versatile. With the music streaming ecosystem growing at a rapid rate, streamers not only have to cater for subscribers of multiple music services, but also to those with NAS drives full of hi-res music in various file formats, and anyone wanting to connect other digital components to it. On top of that, they also have to sound better than the competition. Nowhere is the pressure to deliver everything but the kitchen sink greater than with four-figure streamers - and one of the fiercest rivalries is between the Cambridge Azur 851N (£1400) and Pioneer N-70AE (£1100). Both have an array of features and offer five-star performances. But which one best fulfils the stream dream and most warrants bring slipped into your system? While both well-equipped streamers keep up with the intrinsic demands of the streaming world, Pioneer has the edge when it comes to stream-centric features. The Pioneer and Cambridge can connect to your network via built-in wi-fi or ethernet, and are able to stream PCM 24bit/192kHz files stored on NAS or laptop devices connected to the same network. DSD64MHz support is also part of their packages, although the Pioneer goes further with support for DSD11.2MHz. The two specsheets include Spotify Connect, internet radio and AirPlay too. And the Cambridge offers Bluetooth via an optional £70 dongle. The Pioneer offers direct access to Tidal and Deezer music services, as well as accessibility to Google Play Music, thanks to built-in Google Chromecast. It also boasts FireConnect and DTS PlayFi, wireless multi-room streaming platforms that let users access and share music with compatible components around the house. Those services and platforms are accessible from either the Pioneer Remote or Cambridge Connect apps, both free for iOS and Android devices. The former is largely dependable and easy to navigate – although a few issues make operation a little clunkier than it should be. When coming out of NAS folders, we are taken back to the top folder rather than the one we entered, and in our experience the song-skip function doesn’t behave as it should. Cambridge’s streamer is also more functional than fancy, although we find it preferable for browsing long libraries. If you have more than one Cambridge streamer in the household, it’s easy to switch between them in the app too. In terms of physical connections, both streamers are able to accept other sources via inputs. The Cambridge has optical and coaxial inputs, as well as a single asynchronous USB input for your laptop and three other USB sockets. All the digital inputs are capable of playing hi-res files up to 24bit/192kHz. The Pioneer doesn’t quite have the same input count, with its single coaxial, optical and asynchronous USB inputs and twin USB sockets, so bear this in mind if you need to connect multiple sources. Its asynchronous USB port does expand file support to 32bit/384kHz, though, and it has a 6.3mm headphone output over the Cambridge. 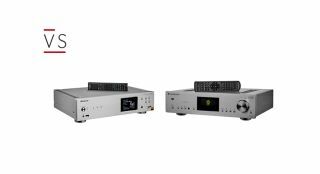 Of course, there are also outputs for connecting your amplifier, with both boxes featuring a pair of RCAs and balanced XLRs as well as optical and coaxial outputs. Around the front, it’s a pretty fair fight. We’re looking at two sturdily built, well-machined boxes that look worth the asking price and, we imagine, will stand the test of time. If pressed, we’d argue the Cambridge Azur 851N’s fascia is the most pleasing to the eye, in either of its silver and grey finishes. Each has a nicely made, proper-sized remote control to accompany them - and, because we miss displays on streamers without them, we’re relieved the Cambridge and Pioneer not only have 11cm and 9cm displays respectively, but that they’re crammed with colourful album artwork as well as playback information. But it’s the playback information you hear that sets these two machines apart. The streamers take it in turns to deliver their renditions of Radiohead’s Reckoner and, while the Pioneer instantly steals the spotlight with its bigger-sounding, spacious sonic canvas, the Cambridge successfully elbows its way into it with superior timekeeping and rhythmic cadence. It has a more meticulous approach towards arranging the patchwork of percussion, and is more explicit when it comes to revealing absolute detail. The Cambridge delivers a greater sense of distinct layering and, between the two, the level of tenderness attributed to the guitar is like the difference between a medium and a well-done steak. Balance is unarguable - there’s punch and depth down low and sparkling bite up top, with solidity fleshing out a clear and articulate midrange. And with its muscular, full-bodied presentation augmented by enthusiastic drive, it delivers entertaining renditions of anything we play through it. While the 851N really shows what it can do with a 24bit/192kHz of Hans Zimmer’s Born In Darkness – giving it a wonderfully insightful, open and layered presentation – it doesn’t sound too compressed when fed a Spotify stream or a file over AirPlay, either. The sound closes in notably, yet there’s still plenty of space and detail to enjoy. That’s true of the Pioneer too, which justifies its streaming service versatility by offering a well-observed performance across sources. As Destroyer’s La Regle Du Jeu plays via Spotify, the musical Pioneer shows it can match the album’s almost bipolar-like character and capture the track’s French cabaret-like jollity - without compromising care and precision. The Pioneer may not have the drive or outright timing of the Cambridge, but its precise, open nature shouldn’t be underestimated. Back to Radiohead’s In Rainbows and the percussive instruments – rattles, cymbals and drums – are crisply drawn and accurately mapped, while Yorke’s vocal slots naturally in middle of the wonderfully balanced presentation. Like all good rivalries, the one between the Pioneer N-70AE and the Cambridge Azur 851N isn’t over in the first round. While these brilliant streamers share a lot of common ground, each sets an example to the other in one area or another. If you own quad-rate DSDs, want direct Tidal or Google Play Music or Deezer playback, like the sound of venturing into multi-room streaming, or are desperate to save some pennies, well - the better-featured Pioneer makes a good case for your custom. However, if your streaming requirements are as flexible as the machines in question and performance is priority, your preference should lie with the superior-sounding Cambridge.